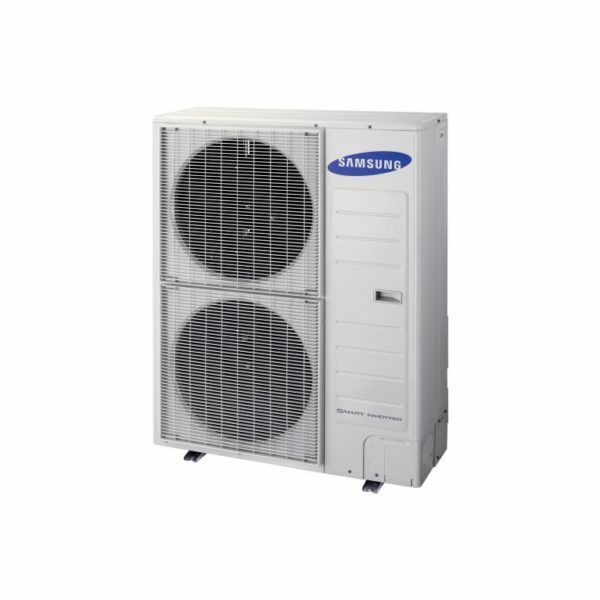 The Samsung 16kW EHS Mono Outdoor Heat Pump AE160JXYDEH-EU 5th Gen is the latest generation in Samsung’s successful range of MCS accredited air source heat pumps. Quickly becoming the go-to air source heat pump, the Samsung EHS GEN5 comes with excellent technical support combined with a competitive price. Useful for most large and small scale installations. Samsung, as the 8th most valuable brand in the world, have a deserved reputation for innovation and quality. While being a relatively late comer to the air source heat pump market in 2011, what they brought with them was a solution to many of the problems that earlier manufacturers had encountered. Innovations such as commissioning information designed around a specific type of installation and an extremely lightweight chassis mean that installation and commissioning is the easiest ever seen from an air source heat pump. The Samsung EHS GEN5 range has been designed with flexibility in mind. Installers have the capability to incorporate many different fuel sources, as well as the ability to cascade multiple units for a single installation. This means that no matter the complexity of the project, Samsung is likely to offer a solution. These outdoor units are 40 percent smaller, more compact and lighter than competitors. Installation is quick and easy. Space saving offered by the EHS Mono system will help to improve business efficiency. Samsung 16kW EHS Mono Outdoor Heat Pump AE160JXYDEH-EU 5th Gen has excellent capacity and reliability in low termperatures. Even if the temperature is lowered, the inside will stay warm and give you comfort. Fast delivery from Cardiff, UK. The company offer EHS Monobloc Heat pumps. Their range is the culmination of years of research in to what an Air Source Heat Pump should be. Simple to install, configure and most importantly use, the EHS Monobloc is the most cost effective solution to the majority of domestic heating needs Samsung also offer comprehensive training, and programs to help heat pump installers grow their skills and overall business. Join our ZERO Home Bills Community. BEST Products from the BEST Brands at the BEST Prices for ZEROhomebills.com on ZEROhomebills.com by Solaranna.